Design Your Own Wedding Dress A Unique Wedding Dress For You! "How to design your own wedding dress using a Dressmaker"
You want a unique wedding dress. 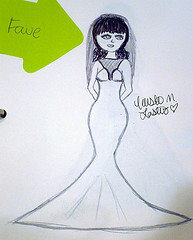 But do you have the skills to design your own wedding dress by drawing a picture like the one you see here. If you said no, you are not by yourself. So what can you do? Could the dressmaker draw a design for you from pictures of wedding gowns you will provide? Yes they could, but you don't have to go that route. If you are using a sewing professional most are able to take your handful of pictures and sketch something up for you. But if you do a little organizing of your pictures, it will save the seamstress time which will save you money. Organizing your pictures or providing a drawing for the dressmaker will help her understand your design concept. But before you can begin to design your own bridal gown, make sure you incorporate what you learned about picking the right dress for you. This is extremely important! You have to know what will look good on you before designing your wedding dress. An additional thought... wedding dress designers all say you should make sure your wedding dress design doesn't overpower you! Your wedding dress should enhance your overall look. When it comes to designing a dress some brides tend to have too many details on the dress. Then the bridal gown tends to look like a costume. Resist the urge to add lots of details to your wedding gown! When you walk down the aisle the first thing people should notice is YOU! Your dress should be second! So try not to over do it. One method that is new and I think you will have fun with is... you can design your wedding dress online. It's easy and it's fun. Your bridal gown design ideas take shape by using design tools that are online. The link takes you to an article listing the design wedding dress online tools that are available. The next methods are more hands on, but will allow you greater creativity. 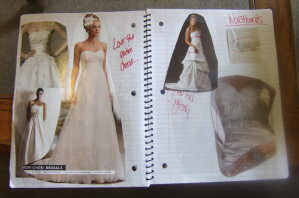 The first is you can cut out pictures of wedding dresses and do a sort of "scrapbook page or collage." I call this the collage method. 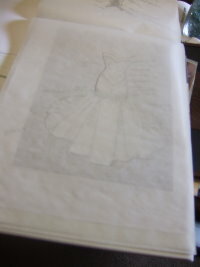 Another method you can use involves "tracing details" off of wedding dress pictures to come up with a drawing. This is the tracing method. These methods were used by brides to show me their design ideas. Even though they didn't draw their designs, they were able to convey their design ideas accurately to me using these methods! You will make a good impression on the dressmaker if you do this up front work. Click on the links below for the method that best suits you to design your own wedding dress. Have fun! Can't make up your mind as to whether you should design your own wedding dress? It's not for everyone. Consider this article before embarking on designing a wedding dress. Do you need design ideas? Find out where to look for pictures of wedding gowns. Learn how to create your own wedding dress by having it re-designed or custom made for you. Do you have the skills to make your own wedding dress? Read this article for tips on how to get started. Looking for wedding gown patterns? Learn where to find them and how to use them to come up with your bridal gown design. Design Your Wedding Dress Ideas everything is summed up in a nutshell. Where Can You Have A Wedding Dress Designed For You? The first place to look is right in your local area. Find a wedding dressmaker to design your wedding dress. Read this article to find out how to pick a wedding dressmaker you can trust to design a wedding dress to your specifications. If you can't locate a dressmaker near you who specializes in cusotm making wedding gown, then the next place to look is on the web. When you want to design you own wedding dress online, here are some sources you want to consider.